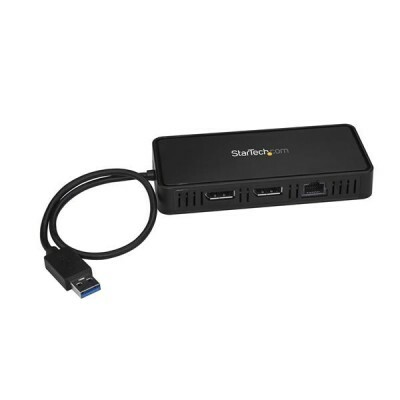 This USB to dual DisplayPort mini docking station makes it easy to create a high-performance dual-4K workstation, connecting your MacBook or Windows laptop to two DisplayPort monitors plus Gigabit Ethernet wired network. The dock features a compact design that's perfect for business professionals who need a highly functional workstation when working or traveling between multiple office locations, or when using shared workspaces. The mini docking station lets you transform your laptop into a highly productive workstation, by expanding the display capabilities of your laptop across two Ultra HD 4K monitors, even if your laptop video card doesn't natively support it. The USB 3.0 docking station supports low-latency, high-resolution 4K graphics on both video ports, using DisplayPort monitors. It works with any laptop that has an available USB 3.0 (USB-A) port. The mini docking station is ideal for producers, graphic and web designers, engineers, architects and many other professionals who work on advanced graphics applications. It offers a fast and easy way to maximize your laptopâ€™s workable screen space, giving you three screens in total when coupled with your laptopâ€™s display. The mini dockâ€™s compact size is ideal for business professionals working in space restricted workspaces or multiple locations, and require a high-performance dual-monitor workstation. The Gigabit Ethernet port provides a reliable network connection in areas where Wi-Fi is limited or unavailable. The mini docking station ensures easy plug-and-play setup with no drivers required. Itâ€™s bus-powered from your laptop, so no external power adapter is required. The USBA2DPGB is backed by a StarTech.com 3-year warranty and free lifetime technical support.